Girls backpacks are not simply smaller versions of your adult backpack. That's why picking backpacks for kids is a combination of art and science. Hiking girls need great backpacks, that's a fact. So finding the best girls backpacks has sent you to this page, looking for tips. First think through why your girl is on the trail. Then help her select a pack from your pared down list of suitable candidate backpacks. Use the following features to create your list of backpacks for girls, and then take a look at the recommended backpacks for dayhikes or backpacking. More interested in boys backpacks? Read this. The reality? Kids backpacks share lots of features! How old and tall is your girl? Is she hiking because she's expressed an interest, or because you're interested in introducing her to the great sport of hiking? Will you be doing short, easy dayhikes? More sturdy long dayhikes? Or backpacking (which is camping plus hiking)? Does your approach to hiking involve car camping? Your answers will dictate which type(s) of girls backpacks you need to look at, and how involved your girl needs to be in the final decision. It's one thing to pull out a backpack at the trailhead and say "Here you go!". Quite another to involve your girl in all of the phases of planning, and completing, a day hike or backpacking trip. And that includes involving her in the process of looking at potential backpacks. As they say, "baby steps" at the beginning, until she begins to express genuine interest in her hiking gear. Try to borrow or rent a backpack for the first few hikes, unless you choose one that can do double duty for hauling books and lunch to school. And here's a thought: If the backpack can be "handed down" to siblings, cousins or social groups, you might want to pay a bit more attention to quality. Recycling the pack keeps it out of the nearest landfill by extending its usability in the community. It's great to think about more girls being able to hike to beautiful places (see below) because of the pack you've donated or passed along. I'll bet she'd love to see this! the level of durability required based on your destinations. Nothing is worse than overpaying for a backpack that is outgrown quickly, or doesn't fit right. Even worse: one that falls apart after only a few times out on the trail. Only you can decide whether you want to go with top name brands that spell quality, or if you'd rather purchase an inexpensive pack that could get re-purposed if hiking turns out to be "not her thing". If the idea of having your hiking girl carry her own food, water and ten essentials on a hike is odious to you, don't read any further. Instead, get a larger, sturdier pack for yourself using these tips. Then you must be in the frame of mind that encourages the little ones in your hiking pack to learn the ropes from an early age. And that includes using a backpack. Only you can determine at what age it's appropriate to begin carrying a pack. With my own children, it was age 5 and up. That might be too old, or too young, for you. A workhorse pack that is proportioned to smaller frames and allows the girl to be fully responsible for the heavy load of her hiking gear. Nothing says you can't start out with the first approach in car camping, and transition gracefully into the second approach using the girl's cues and curiosity, right? Do you want your girl to carry her teddy bear (a young hiker) on the trail, or her sleeping bag (a tween)? Keep your answers in mind when you examine price points and durability, which are intertwined like moss and fungi in lichens. The obvious answer is that it depends on the size of the girl. How much "stuff" is she going to carry? Through what kind of terrain? A tiny little pack might become frustrating when she gets a bit older and switches out her teddy bear for her field guide to birds. A medium sized pack might be "fit for purpose" for dayhikes as well as short backpacking trips. A large pack might be right for a girl who is in the higher percentiles for height and weight for her age, or who is asking to do more aggressive hiking trips. Again, it circles back to talking with your girl and using your best guess about what she envisions for her trail time. Factor in your own ability and willingness to carry everything, versus your desire to begin the gentle indoctrination toward self sufficiency. Also note that with increasing size comes increased weight of the pack itself. Ultralight girls backpacks are going to be pricey, but if you're committed to teaching her "go light" principles of hiking, you might want to take a look at them. Here are some guidelines for backpack capacity. As expected, larger volumes mean heavier packs, but you might be pleasantly surprised at current weights. On the low end: 8 - 12 liters. Great for short, simple dayhikes. Medium range: 12 - 15 liters. Useful for carrying ten essentials. On the high end: 30 - 75+ liters. Backpacking packs for sure. Here's where it gets a bit sticky. You want the pack to be comfortable, fit well, be large enough but not too large, and last for more than a few hikes. But you probably don't want it to last for years and years and years (like your own pack), unless there are younger family members coming along in the hiking clan. = the packs you have on your list to consider. If you stick with high quality gear brands, you should be quite pleased with how many times the pack can be dropped in the mud, dragged along the trail, or used as a chair in the snow. You can also go the other route for girls backpacks: buy the bare minimum pack and replace it every year when the zippers jam, the seams rip, or the the fabric frays. The wisdom of this method? The pack can be matched to your growing girl every year. You'll end up paying more over the long haul, and you risk burdening your child with a pack that just doesn't fit well or cannot perform adequately on hikes. Because I only recommend what I've tried myself, I'll show you girls backpacks from brands that are good buys for different types of hiking. For girls just starting out on a hiking trail (and I don't mean at a trail head, I mean in her hiking career at ages 5 - 8 years), why not start small, light, inexpensive yet fairly durable. REI makes a great little pack that is only 12 ounces in weight, has a 12 liter capacity, an option to add a hydration reservoir, and is built from 420-denier nylon (that's a very good thing in terms of durability!). And if your daughter is as crazy about the color pink as mine was, she's going to love the lovely pink option (although a more subdued green is also available). The $35 price point is quite close to unbelievable. For girls older than 8, or with longer torsos compared to their age group, a larger pack is required. Osprey is a trusted band in my own gear locker, and this pack should perform for many seasons. 15 liters is still small, but adequate for some essential trail gear like a jacket and lunch. If your girl is up for a backpacking trip, it's essential that her pack can handle her sleeping bag along with her clothing and food. Here's a pack that has an adjustable torso length to accommodate her growing body, and all of the features you'd demand in your own pack in terms of ventilation, strap adjustment, loading compartments, hip belt and shoulder strap comfort. Deuter is also a trusted name in backpacks, and I use different packs from them on a regular basis. You can go the water bottle route, or use a hydration reservoir with this pack. Nice versatility - let your girl figure out what works best for her. $99 is not an outrageous price to pay for a pack of this quality. And remember, an adjustable torso means you'll get more than one year out of this pack. Don't be shy about picking a pack from the line-up of girls backpacks for your hiking girls. Your likelihood of making a major mistake is zero if you stick to reputable gear vendors like REI. They have a great return policy! Pay close attention to adjusting the straps and shifting the load for maximum comfort. Watch how your girl is striding (or not) down the trail, and fine tune the pack for her if she appears to be lopsided, struggling or off balance. Teach her how to respect her pack as her "home away from home" by showing her how to pick it up and take it off properly. Show her how her comfort and safety are tied directly to her backpack. Let her customize her prized pack with a few colorful carabiners or other useful but inexpensive items that catch her eye: a whistle, patches, stickers, etc. 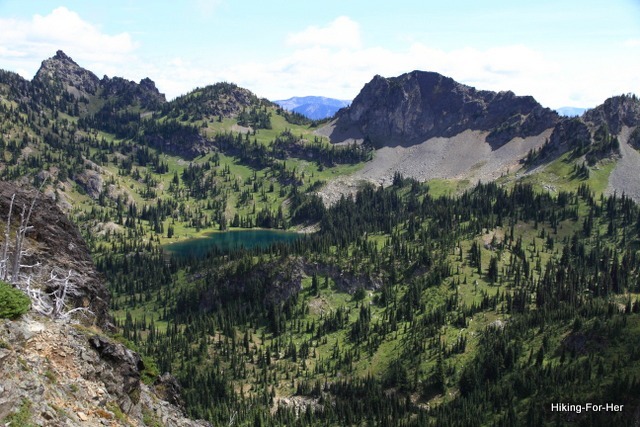 And a few more trail tips for hiking with kids right here! Thanks for getting the next generation out on the trail! Best wishes for picking girls backpacks that gets your female pups into the hiking pack with ease and comfort. 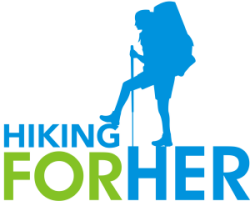 If you purchase gear using the links on this page, you keep the Hiking For Her hiking tips free and available to all - without costing yourself one extra dime. Your support is appreciated and vital to this website!